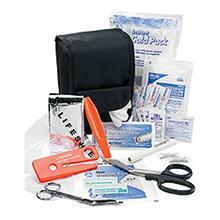 EMS and rescue personnel have always searched for the most complete, compact, economical and hands free response kit. EMI has found the solution - introducing the Emergency Medical and Trauma holster set. This new breakthrough holster set is essential equipment when responding to emergencies at sporting events, concerts or disaster situations where hands free response and treatment is crucial. The specially designed over-sized holster includes a front pocket for medical gloves, and a water repellent protected main compartment. 1000 Denier nylon cordura. Fits belts up to 2¼"W and measures 8½" x 5" x 3".